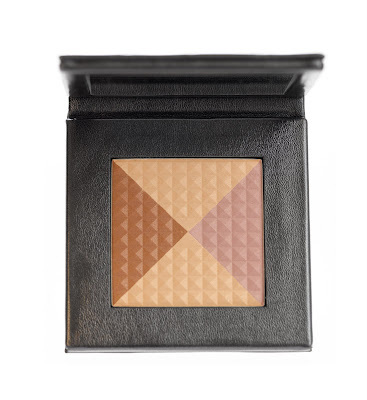 All thoughts of Sliders aside, the new Fall Dimensions Eyes and Cheeks palette from Prescriptives totally makes my face look like it's entered another dimension ... the dimension of glowing, ethereal beauty! Part of Prescriptives' Daring collection, this palette is comprised of three eyeshadows, blushes and bronzers that highlight and contour your eyes and cheeks to utter perfection. They're housed in an absolutely stunning palette of gleaming, glistening smoke-hued leather, crafted with faceted raised detailing for added shimmer and glimmer. The shades inside include taupe, chestnut and lavender, each dusted with just a hint of sparkle. Rather than use one shade at a time, I like to take a large kabuki brush, run it over all the shades in the palette and sweep over my cheekbones for a subtle yet totally gorgeous glow. If you do want to split the colors up, however, the lavender is my favorite -- it adds a beautiful glittery lightness to the eyes.